Once upon a time there was a knitter named Carol. She got up Tuesday morning and wondered, “What shall I knit today?” She glanced at the three beautiful, partially-knit scarves in her knitting basket and thought, “I know! I’ll cast on a shawl.” And so she did. She listened to podcasts on her iPod and knit steadily, pausing only to eat, sleep, and browse her favourite knitting sites. When Wednesday evening arrived she snipped her yarn, drew it through the last stitch, laid down her needles, and proclaimed, “Wow, that was easy.” She blocked the shawl the very next morning and lived happily ever after. The End. 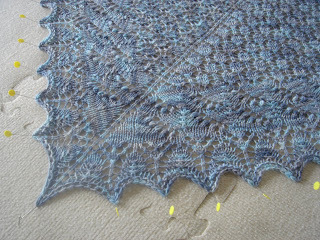 The Swallowtail Shawl, knit in Sunshine Yarns’ wool/silk in the “Stormwatch” colourway. At about 48" x 23" after blocking it's really more of a scarf than a shawl. I am giving it to my sister, Jeanine, for her birthday. To tell you the truth, I am not entirely sure if she will wear it, even though the soft blues will look great on her. She's rather (ahem) particular about her clothes and she may decide that she prefers a more conventional scarf to wear with her winter coat. In any case, it was fun to knit. I haven’t been feeling very well this week (some sort of virus, I think) and it was the perfect thing to work on while vegging out on the couch. The shawl incorporates three different stitch patterns, which were interesting to knit but simple to memorize. By the time I was beginning to tire of one, it was time to move on to the next. By now you know that I am rarely monogamous to one project but this one managed to keep my attention for two full days.